About a month ago, The Mirror Lies nominated me for the Sisterhood of the World Bloggers Award. More recently, I was nominated by MrsMuffinTop I’m grateful to them both, and have decided to answer all of their questions. Scroll down for my nominees and questions. 1. What was the inspiration for the title of your blog? 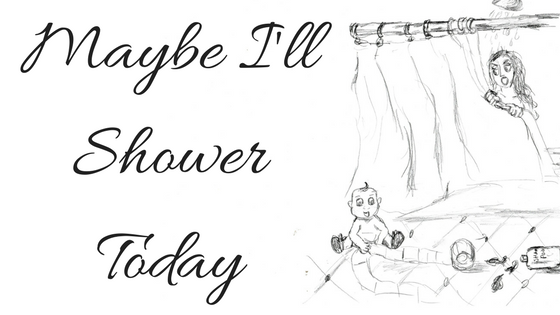 I have a young son, who likes to be with me pretty much 24/7, making finding time to shower in peace quite difficult. I thought other moms could relate to that struggle of wanting to be there for your children and finding time for yourself. I would say it was finding I still had a voice and a purpose outside of motherhood. Since having my son, I have come to appreciate having family close by. For that reason, I am pretty happy where I am, which is Brooklyn, so not a horrible place to be. If I could have my family with me, I think London or Paris would be quite nice. 4. Who is the one political figure you’d like to give a piece of your mind and why? Going to take a pass on this one. I do have strong views, but I am trying to keep them off my blog. While my favorite book is probably Fight Club, I will say Animal Farm for its sheer brilliance. Not being enough for my family. Pretty much everything my toddler does. He is my greatest muse. A nice pasta dish…and chocolate. 9. What are you grateful for today. I’m grateful for my loving and supportive husband, who enables and encourages me to be with my son. I’m grateful for my extended family for helping me with my son when I need a break. I’m grateful for all of the kindness the blogger community has shown me. 10. What is the one thing you’d like to accomplish over the next year? I’d like to establish myself as one of the top voices in the parenting space. Not being enough for my family. Oh, and being stuck in a tight, crowded space. Remind me again why I live in NYC? 2. What’s your fondest memory? My wedding day. It was a perfect, October day, and there was so much love everywhere. 3. Dog or cat person? I do like both, but if forced, I have to choose cats. Fight Club I can’t talk about it. 5. What is your secret talent? 6. Do you have a retirement fund? Yes, and you should too! 7. What is the one thing that can make you smile after a really hard day? A silly Internet meme or video. 8. Are you a Fifty Shades girl, or an Emily Bronte? Neither, I am more of a dude when it comes to reading. Showers, though baths are nice. 10. What is one thing that you wish people knew about you, but were afraid to tell them? I wish people knew that just because I am a mom, it doesn’t mean I’m no longer fun. Life of a Traveling Navy Wife, The Malleable Mom, The Mom Cafe, Queen of the Land of Twig and Berries, Confessions of a Mommyaholic, Zoe vs. The Universe, One Funny Motha. 3. What is your favorite indulgence? 5. What is happiness to you? 7. Are you a neat-freak or a total slob? 8. What cocktail best describes you? 9. What is the coolest thing you have ever done? 4. Nominate 7 other blogs and let them know via comments. I am so honored to be nominated! Thank you. I will won on these this week. Loved your answers to the first #2 & #3. Thanks so much for the nomination. I’ll check out Fight Club. I will read anything (and probably love it)! Did you see the movie? It’s pretty similar.